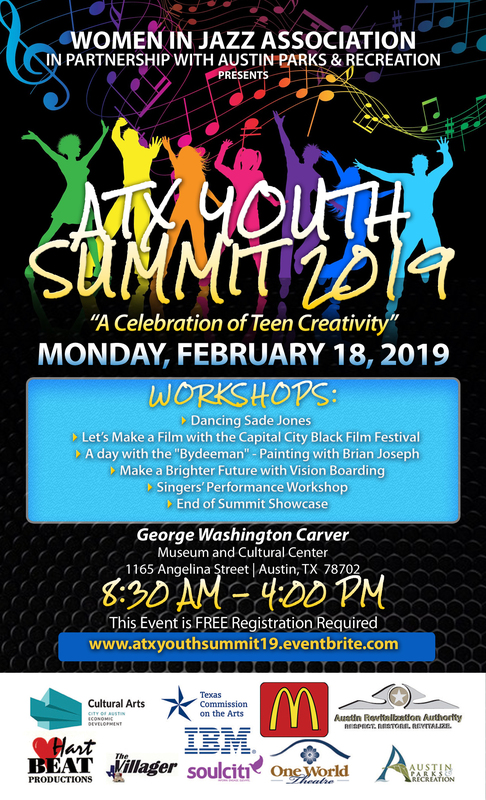 ATX Youth Summit 2019: A Celebration of Teen Creativity – Women In Jazz Association, Inc. Lunch and snacks are provided. Free admission. Registration is required. This project is supported in part by the Cultural Arts Division of the City of Austin Economic Development Department. Women in Jazz sponsors are the City of Austin, City Parks and Recreation Department, HartBeat Productions, IBM, McDonald’s Corporation, Austin Revitalization Authority, soulciti.com, and Texas Commission on the Arts.